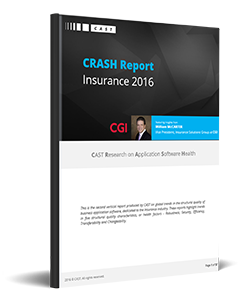 This is the first vertical report produced by CAST on global trends in the structural quality of business application software, dedicated to the Insurance industry. Detailed within are trends for five structural quality characteristics, or health factors, including Robustness, Security, Efficiency, Transferability and Changeability. The report includes industry insights on Insurance technology challenges and opportunities from CGI.